The CARE 2852 is one of our more popular models due to its optimal size which makes it easy to maneuver through doorways. It also comes with several, wonderful safety features to restore your confidence and once again allow you to experience harmony during bath time. It’s not surprising that the bathroom is known to be the most dangerous room in the house. With its wet surfaces and obstacles for seniors and those with mobility concerns, the bathroom can truly be a difficult space to navigate. The CARE 2852 comes with a low 6″ threshold to counteract the standard 38″ threshold of a typical American bath tub. You can enter and exit your bathtub again without worrying about the slips and falls that might occur as a result of elevating your legs over a tub threshold that is not optimal for you and your range of movement. Enjoy the security of the V-shaped, watertight, lightweight, outswing door which allows for easy access to your bath while minimizing the dangers of a wet bathroom floor. Our ADA compliant, 17″ high seat is another integral feature of our walk-in tubs, which allows you to nestle yourself into the soothing, healing water of your bath with peace of mind. The non-slip, easy grip floor comes standard with each of our models and adds extra assurance that each bather can position themselves in the bath without fear of loosing one’s footing. In addition, we offer a fully integrated, ergonomically designed safety bar and an additional U-bar to enhance your ability to sit, stand, and adjust yourself while in the bath. We care about your safety. It motivates everything we do. When you use one of our walk-in tubs, you can rest assured that your safety and well being have been taken into full consideration. Measuring at 28(W) x 52(L) x 40(H) and 41” deep, the CARE 2852 provides ample room for you to recline in your seat and dissolve the day’s cares away in peaceful, blissful water. We understand that bathroom renovation can be a stressful experience. We have designed our walk-in tubs to eliminate this stress. The CARE 2852 is designed to replace your existing shower stall or bath tub. It comes complete with a standard 60″ wall extension kit to ensure that your new walk-in tub slots seamlessly into your bathroom’s floor plan. We offer a flangeless design with our tubs to ensure that you can preserve your current tile work. This also helps to cut the duration and cost of your installation, which is always a desirable incentive. If needed, we also offer an adaptable tile flange kit for your convenience. We want your experience with us to be favorable and pleasant from start to finish. It is our goal to expedite the process of your installation, so that you can start to enjoy the healing and salubrious benefits of your new walk-in tub as quickly and efficiently as possible. We take pride in providing you with the highest quality walk-in tub on the market. We don’t cut corners in the manufacture of our products. Each of our walk-in tubs is constructed with a one-piece stainless steel frame made of woven marine-grade fiberglass, which means that your walk-in tub is crafted with the strongest fiber glass on the market. This gives our product an edge over other walk-in tub companies who manufacture their walk-in tubs with lower quality acrylic and/or plastic. We coat your CARE 2852 with a triple gel coat finish which is not only extremely durable, but it also makes your bath tub easy to clean, which is an auspicious actuality for anyone. Our walk-in tubs can be ordered in either biscuit or white: colors that match virtually any existing bathroom décor. With 6 adjustable, levelling legs, your walk-in tub can be modified to a level that is perfect for you. 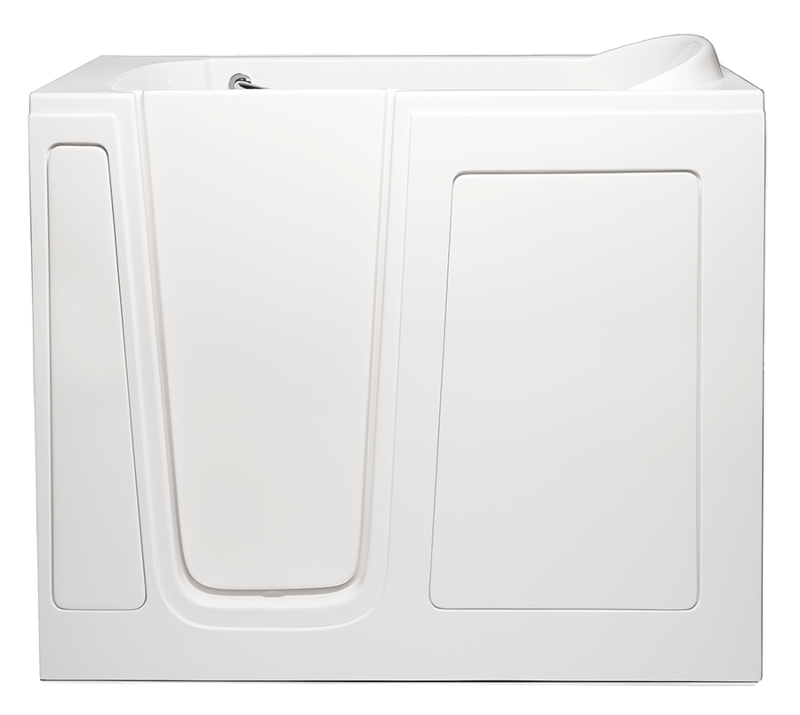 You can be sure that when you experience the CARE 2852, you are appreciating the best walk-in tub on the market. We aim to optimize your bathing experience so that it’s not only safe, but also enjoyable. With this in mind, we have crafted several easy to use fixtures and fittings for your gratification. The LOVE 2852 is manufactured with a beautiful and resilient chrome plated faucet set, which is fitted with easy to use hot and cold water handles alongside a user-friendly diverter. The multifunctional, adjustable, and extendable hand-held shower handpiece comes standard so that you can shower as well as bathe. Additionally, our anti-scald faucet system ensures that the water temperature remains just right to avoid burns. 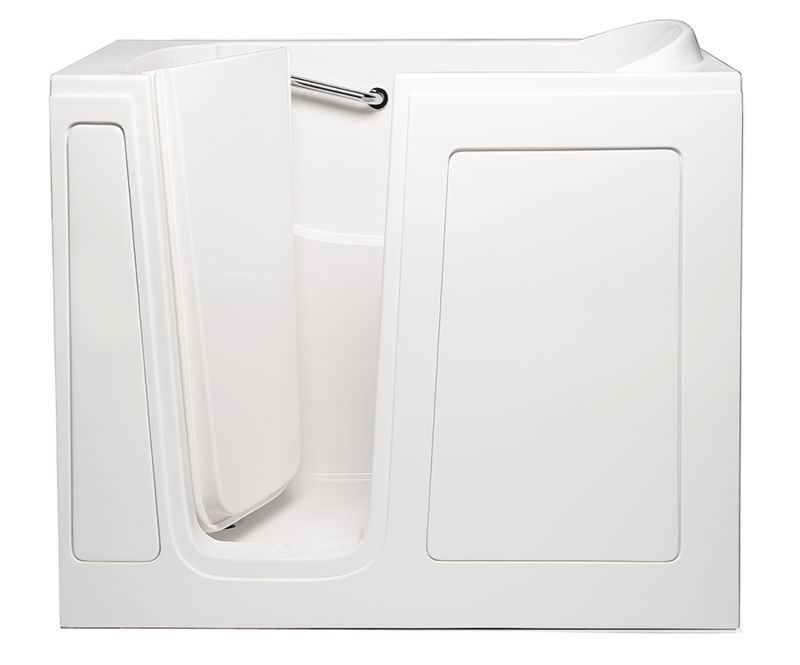 Our walk-in tubs come equipped with a 1.5″ cable operated drain making draining the tub effortless. The integrated door drain keeps the door threshold free of excess, hazardous water. Most buyers opt for our patented 2″ Hurry Drain which enables your tub to drain in roughly 110 seconds, depending on water level and household plumbing. We have designed our walk-in tubs with the accouterments to maximize your bathing experience and ensure that your bath time is both safe and exhilarating. Along with our wonderful, standard fixtures and fittings, you can also customize your CARE 2852 with amazing spa features for a unique and euphoric bathing experience, every time. Some of our personalized feature options include the Dual Air and Hydro Massage unit which combines 10 powerful hydro jets with 16 exfoliating air jets to alleviate joint and back pain and promote circulation. We also offer Chroma and/or Aroma Therapy to promote both mental and physical well being. Different colors and scents have been proven to affect our circadian rhythm and our moods. Chroma therapy uses various colors of light and aroma therapy uses various smells to stimulate the circulatory system, calm pain, and promote peace. You can visit our Features page to view more options. We are happy to offer customizable options to suit our individual customer’s needs. Customize your CARE 2852 today, and start enjoying a relaxing and therapeutic experience every time you bathe. Lifetime limited warranty on stainless steel frame, door, door seal and tub shell.